Hotels. Especially hotels in beautiful places like Hawaii, are like necessary evils we learn to accept as part of our destination. There are places where eco-tourism was part of their upbringing, but the infamous strip of Waikiki on O'ahu Hawaii is not one of them. It is the quintessential concrete jungle, so intrusive on the turquoise waters, the otherwise pristine beaches, and hmmm, what did this strip of beachfront tourism look like before construction? Not many can remember. I talked to a few people who were alive before these hotels went up. They recalled a sky filled with the sillouehettes of cranes. I had also heard that the construction couldn't proceed until much of the swamp-like marsh was cleared. Some quick fact-checking confirms this. The pre-Waikiki area consisted of wetlands, which Governor Pinkham decided to drain to a canal. In 1921, construction on the famous Ala Wai Canal began. Today, you can see outrigger canoes gliding along on this murky water, which is flanked by traffic on one side and houses on the other. At the same time, these towering monoliths take you above, and separate you from, the fray. They allow a person to enjoy the infinite horizon, the breakers, the sunsets, from a personal enclave, or an isolated perch if you will; perhaps 27 stories above the sea, give or take a few stories. 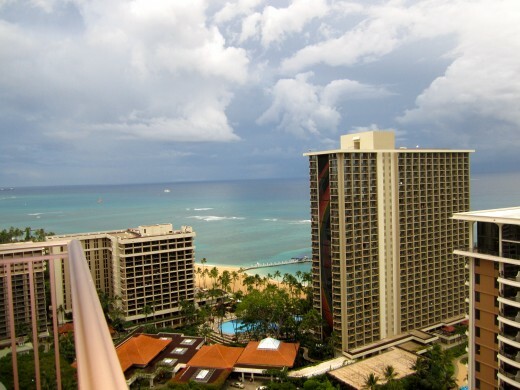 Above the busy tourism of Waikiki; the best place to be if you are not in the ocean. However, if you are more comfortable wandering among the stores in the Waikiki shopping district, this is where you want to be. It is within striking distance of the mini-metro area that is downtown Honolulu, where mom & pop Asian grocers and Chinese herb shops still thrive, dive coffee bars and eateries abound, and the homeless are so prevalent they block some sidewalks. The homeless on our last trip to Hawaii were a shock. They not only lined sidewalks, but there were whole encampments at Ala Moana park. It is only a small island however, and a bad economy is doubly painful to an island community. Hawaii thrives on tourism, and when it slides, people wind up on the street. Compound this with Japan's nuclear disaster which caused millions of Japanese tourists who would otherwise have been spending their money in Hawaii, to stay home instead. The effect of all this is predictable. As we pass one group of people literally sleeping on the sidewalks, I remember an old rumor from when we used to live here. It's a fragment of conversation in my mind that goes something like: 'Other cities send their homeless to Hawaii. Hey, if you have to be homeless, it might as well be in Hawaii, at least you're in paradise,' or something along those lines. As I look at the folks camped out around town, it's clear how naïve I was to believe that statement on any level. Whether or not other cities handed out plane tickets to Hawaii just to get rid of their homeless, I don't know; but from the looks of it, being homeless is a degrading and miserable situation no matter where you are. Can paradise really exist around all this misery and destitution? It can, it does. 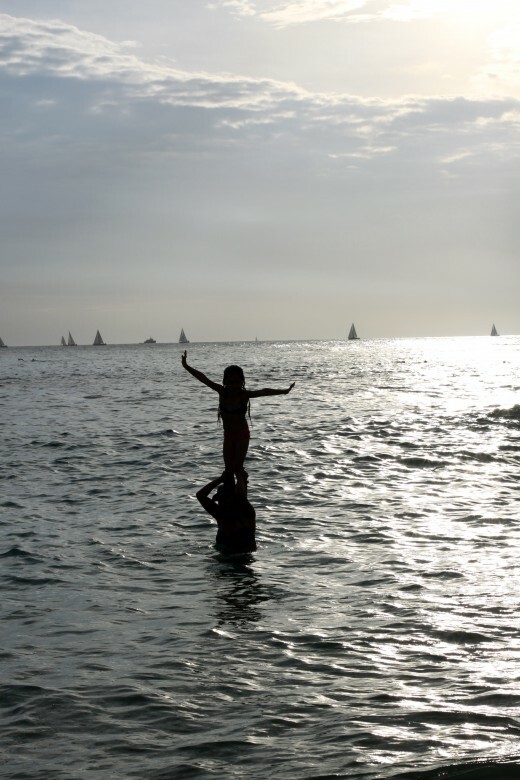 And even though there is no longer any spot on O'ahu that remains sacred from the exploring tourist, O'ahu, which means 'the gathering place," treats all comers, and pushes the breath of life into most of them. Downtown Honolulu is usually a place for visitors and locals alike to go out to a nice dinner, a club, or enjoy both, plus it has a riveting sunset scene complete with enormous tourist ships at Aloha Tower that make it a dynamic way to spend/end the day. Party here when a tourist ship docks, and watch hundreds of visitors disembark from the light swallowing behemoth floating at anchor. Ask them their names, look at their faces. You are going to meet Germans, French, Brazilians, Chinese, Koreans and English. The Swedes and other far Northerners will also share their native tongue, and still more from every corner of the world stop here to experience some sense of Hawaii. 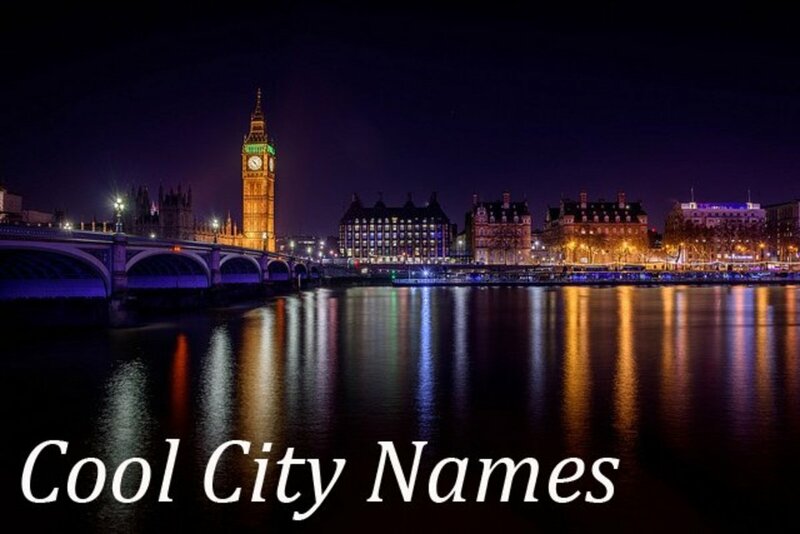 Downtown is also the place you go to entertain lascivious debauchery at one of the notorious strip bars nearby, or a 'buy-me-drinky' hostess club. Back of the house favors in hostess bars are a well known but unspoken of business. But on an island so packed with people from a cornucopia of cultures and backgrounds, an undercurrent of secrecy is necessary, vital even. These are small parts of Hawaii, though. Like most metro areas, it is an amalgam of flavors, smells and mixed crowds. You can find the best malasadas (Leonards!) on the island here, or experience Duke's restaurant on the beach in the heart of a sea of prosperous tourists. The 15 block area of Chinatown alone offers fresh fish and vibrant produce markets, and everything from traditional Chinese to Laotian and Thai cuisine can be found here. Downtown is not just the gateway to entertainment, either. Serious business happens in a clean corporate district that is the heart of this area, and both BYU and Hawaii Pacific University have campuses here. Both can boast of an attendance roster filled with students of dozens of nationalities. For all its densely-packed, rich ingredients, within 5-10 minutes one can be rid of all traces of this bustle, and be shooting past Kapiolani park towards the famous Diamond Head Crater looking out over the Pacific. Bound by parking space battles at Ala Moana shopping mall one minute, wrapped in a womblike tunnel of calm green grass and gentle waves lapping against an eroding shore the next. 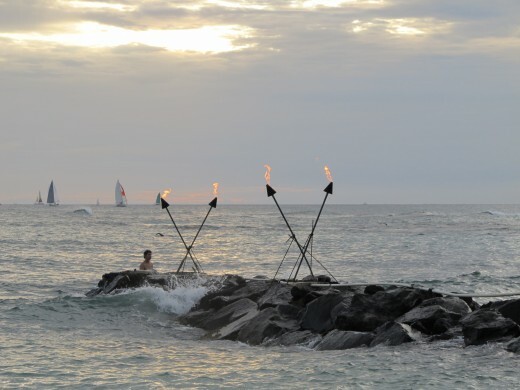 Here you may just want to stop, because across from Kapiolani park is Queen's Beach and the more private Kaimana Beach Park, which shelters the exclusive Outrigger Canoe Club. For some strange reason, if you have made it even this far, it will seem like a world away from that Hawaiianized modern-retro chic strip, (for lack of a better term.) Park along the street and head to a small stretch of sand fronting calm waters. This is Kaimana Beach, and If you drive too fast, it is easy to miss. Which is fortunate, because many do, and it leaves more sand for locals and informed visitors. Still, even full of people this beach has a mellow vibe. The giant lagoon-like waterfront here is sheltered by a reef, and even this small space has one of Hawaii's well-trained lifeguards on duty. If you are lucky enough to know somebody who is a member, enjoy beachside lunch or dinner and cocktails next door at the Outrigger Canoe Club. Or climb up on the rocks and check it out for yourself. Either way, the tropical air has already started to infuse its essence into your brain. Maybe you can put Diamondhead off for today, and just lay here, letting the sun's warm rays and the ripple of the curling waves become a bad influence on your practical life. 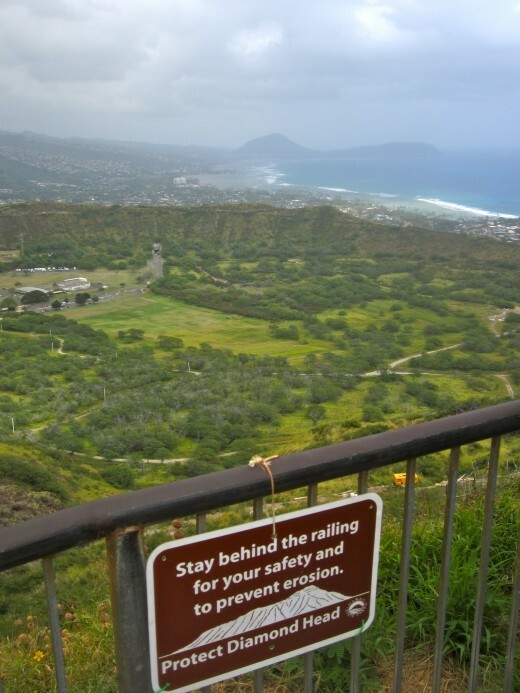 Fortunately it is not difficult to get to Diamondhead from here. The short trip is easy, and the famous and populated tourist spot is actually worth your time. Besides, tonight you will no doubt eat large quantities of food, consume too much shave ice, ice cream, fresh-brewed beer or tropical cocktails, so you need this hike. Called Le'ahi in Hawaiian, this natural spectacle draws a stunning number of tourists and locals, and starts off in a rich swath of greenery and vegetation. The hike climbs inexorably to a 780 foot summit, which culminates with a couple of steep stair climbs, a passage through a dark tunnel, and a stunning view at the top. Why build a trail up the side of a dormant volcanic crater? This was the path started in 1908. In 1917 it was taken to the artillery station and bunkers at the top, which you must crawl through to experience the ethereal view it hosts today. You will want to hate the crowds, the tourist buses pulling in as you arrive. You may question the intelligence of doing this today, but don't bother, start walking. 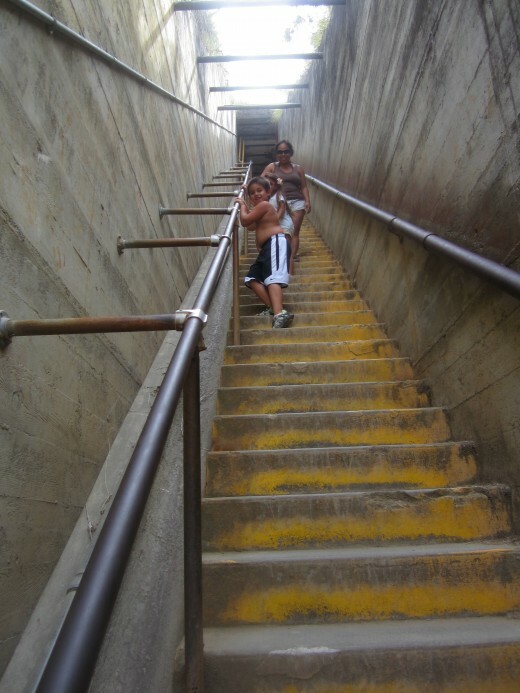 People will in most cases let you pass, as they do local runners who use this steep vertical for a heart-slamming workout. Once at the top, take time to find your space. Enjoy this view, there are few like it on Earth. Take a group shot for someone, hand your camera over and let them take one of you. Good, now get back down and buy a shave ice from the truck waiting at the bottom of the trail. You earned it. If there is something you must know about this place, about this island, it is that the people, whether born here or visiting, belong to the land. Don't let anyone tell you different. Within a week you will understand the spell it has cast on you and the deep respect you have acquired for this place; strangely, to some this place is just a commodity. On O'ahu in particular, all things are closer to you. 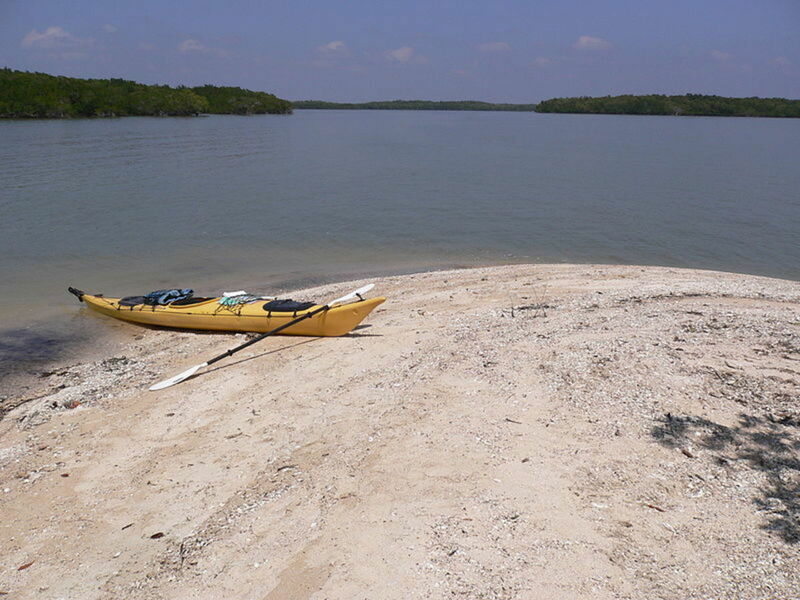 An island which takes only 4 hours by car to circumvent leaves little room for getting away from the detritus of life, which exists even here. A man is beaten to death in a busy shopping center parking lot for being a white foreigner even as a midwestern, or Japanese, or local family basks in the breathtaking and almost surreal beauty of Makapuu, Kailua, the North Shore, and so on. Hawaii is a contrast not unlike many heavily populated island nations. It is not that bad things don't happen in paradise, or bad things don't happen because of the color of your skin, Sometimes they do. O'ahu is not immune to these things because it is a paradise, it simply has the power to hide them from view, because all things on this small island are closer, and it must. 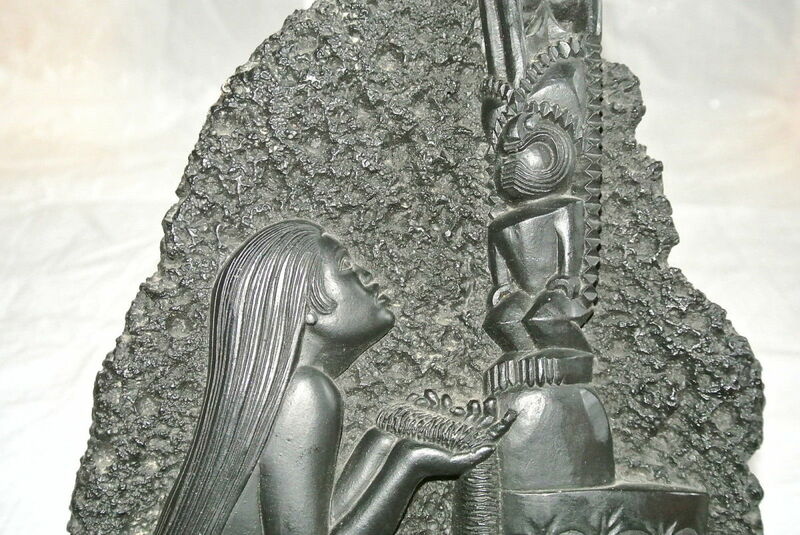 Here on the islands of Hawaii, there is unspeakable beauty emanating from the land and the people that live here, but even before the first Westerners arrived, there was intense conflict over the rule of this raw beauty. Today these battles are one-sided, even though there is passionate resistance to most new development on the islands. 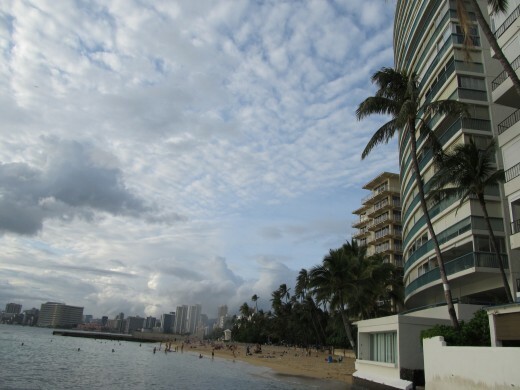 The modern world Hawaii exists in is a catch-22; hotels and resorts are an enormous drain on natural resources, yet they provide a steady source of income for thousands of residents. For many visitors, these resorts are the ideal way to experience Hawaii. An all-inclusive experience complete with a Polynesian tourist luau, built-in shopping and private beaches and grounds. One can visit Hawaii without ever really seeing Hawaii. There are other ways to experience O'ahu; rent a house on the beach, avoid tourist traps and shop at the local grocery store, for one. To get closer to the land, consider staying on the Big Island of Hawaii on an eco-friendly vacation. 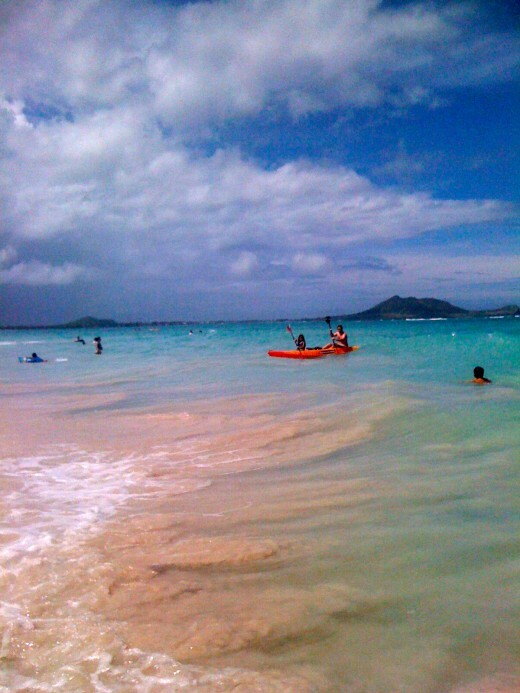 Leaving the island of O'ahu for an unadulterated experience isn't necessary quite yet, however. 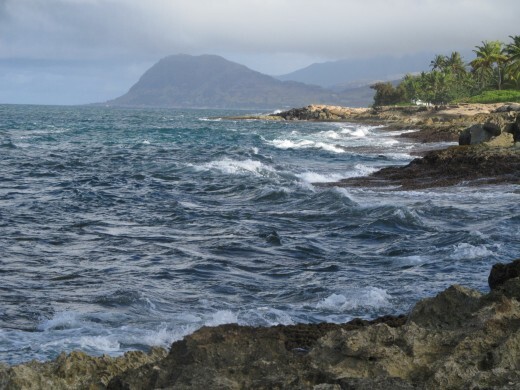 To get away, head for the country of the North Shore, Ewa Beach, or the Windward side. Construction in these areas of the island has so far been kept to a minimum, although this is rapidly changing. For a long time one could count the number of hotel resorts on the outskirts of O'ahu-two. The super-resorts in Kapolei have squashed that number. Two magnificent, or atrocious, depending on your point of view, hotel resorts offer a secluded, hyper-inclusive vacation spot just far enough away from everything to feel like their own islands. The latest is Disney's Aulani resort. Designed, as Disney will do, to be the most perfect, manufactured island wonderland in the entire chain of Hawaiian Islands. To be fair, it is an architectural, design and engineering accomplishment that stuns and absorbs. Between the lush pools, spa facilities, lavish landscaped grounds and oceanfront views, it is easy to forget that the real island is a few miles down the road. It rushes by in sometimes traffic-clogged freeways to work; pulls into the parking lot at Target for diapers or a special on toothpaste, and buys bulk ground beef and yes, Spam at Costco. This is the point of course: Only the storybook image of Hawaii shall pass. Disney's Aulani even perpetuates their own Hawaiian cartoon storybook theme with "Aunty's House," a place for children (and adults if they like) to explore Hawaiian culture with the always smiling and generically named 'Aunty." In Hawaii, you call just about every older woman you know, but may or may not have relations to, as 'Aunty' out of respect, and Uncle for the male gender. It is hard to define exactly what this broad stereotype perpetuated at the Aulani does to the local Hawaiian's temperament; maybe nothing at all. Much of the commercialism mainlanders are quick to get their hackles raised over is shrugged off by locals. Sitting in one of these super-resorts for part of our last visit, I remember at least one reason this is true. "Brudda, whatevahs. Betta they stay in Waikiki, so we nevah haf to see 'um." Maybe that's an exact quote; there were many like it in our years living on this island. There were just as many open doors and friends that became like family. Hawaii's constant contrast. 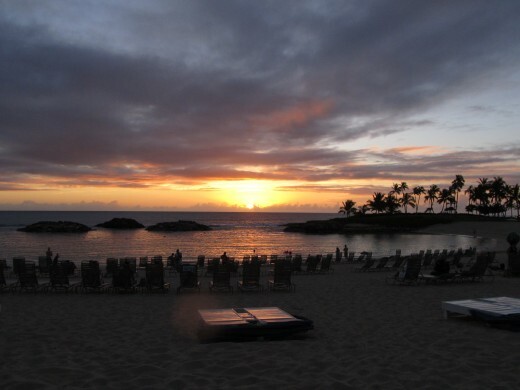 Pictures from the Ko'olina super resort. If this is what you came for, you don't have to leave this place to get it. These are islands within the island, and they encourage you to stay. If seeing the nitty gritty and experiencing the uber-flavors of Hawaii is not a priority, why not? It is just as easy to throw yourself into local culture and avoid the mega-spa-resorts, Waikiki and anything remotely luau related. This is too easy, and you will save hundreds, nay, perhaps thousands by digging in deeper. The 'real' Hawaii is still there. In fact it never left. It is what it has become; like everything in life, it evolves and adapts. These thoughts come to me even as I bask at the pool of the Ko'olina Resort, a bright, rum-soaked mai tai at the table beside me. This is where we chose to spend the last three days of almost two weeks returning to the island we once called Home. I reflect on the days before, one in particular spent with family (who still live here) at Ali'i Beach Park in Haleiwa. These were our times, our weekends. Barbecuing on a little hibachi at the beach, a quiver of surfboards stacked in a nearby tree or bush. Kids and adults scrambling over the reef to paddle to the break just offshore. Always, always in an untamed location touched just enough by the hand of man to park a car and have a nearby bathroom and shower. How could we leave this? What would be waiting if we returned? Should I feel guilty about enjoying this resort, knowing what it stands for? What it is? We ran into Scott Caan, from the modern Hawaii Five-O at Ali'i beach that day, or rather my daughter ran over to play with his dog. Seeing him enjoying his own space, without anyone hounding him, made me think of how absorbed one can become in the lifestyle here. You learn to be humbled by this place, to appreciate and respect it. If you can do this, it doesn't really matter where you stay or who you are; chances are good the island will welcome you. You can feel free to explore, or free to stay in one place and breathe in the intoxicating air. If you've been to O'ahu, Hawaii but missed out on the Windward side, you are missing out on a paradise of ancient proportions. Catch a slice of the beauty in this journey back. Resistance bands are a proven way to stay strong and build muscle and they are en excellent as traveling workout equipment. Get a great workout on the road with just a small package of resistance band and without spending a lot of money! If you enjoyed this hub, please share it with someone who can use some paradise today. Cheers, Mo. Thanks Crystal! Don't worry, after 15 years it is still waiting for you and still beautiful. Aloha! It's been 15 years since I've been to Hawaii. Much too long. Looking at these photos, I'm ready to move there! Beautiful hub. Glad I stumbled across it. Voted up and beautiful. I had second-hand knowledge of this activity (I knew people who worked there or someone who had paid for 'services') in several clubs, but my impression was that there were dancers who kept their distance from this activitiy and those who participated in it. Keep in mind, this was several years ago, and I'm sure not every club is like this, nor does every customer know it's available when it is. ytsenoh, thank you so much for your kind words. 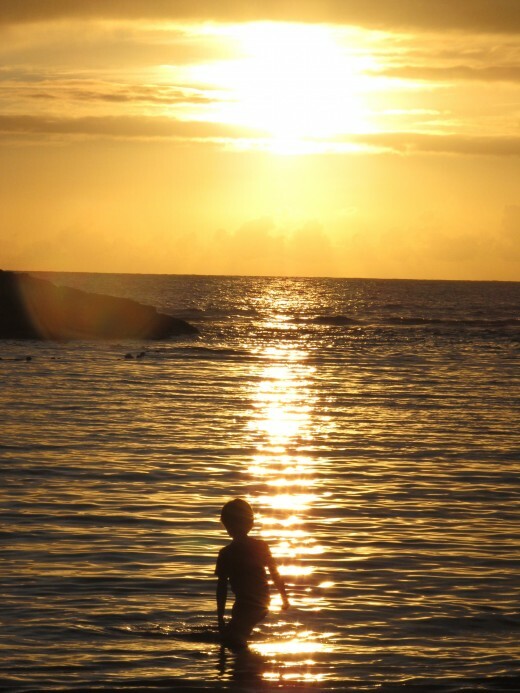 Living on Kauai as a child must have been a special experience. 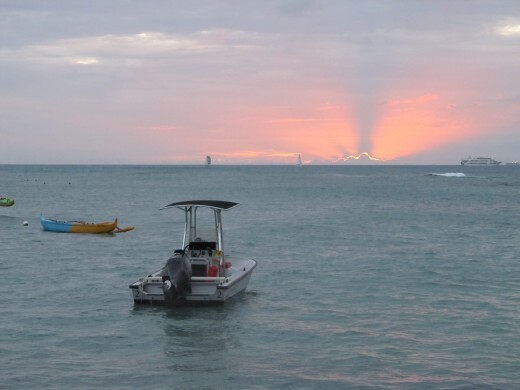 The dichotomy between being a natural paradise and economic survival is especially poignant on the outer islands; and what is more sad, that the places with such rich memories are torn down, or that they can be so easily forgotten once the new building is in? If nothing else, the simple life you speak of is something they will always have. It's a very fulfilling existence. Hoping to make it there in the next few months. Thanks for commenting! Mos, bravo on your article. I lived on Kauai as a child and saw Oahu as a child and adult and have seen the dramatic changes. I always tell people to go to Kauai, although there are parts of Oahu that have its ravishing beauty; Kauai is less touristy or commercialized. My family lives in both places, they are true islanders and will never leave. When you say, "If there is something you must know about this place, about this island, it is that the people, whether born here or visiting, belong to the land. Don't let anyone tell you different. Within a week you will understand the spell it has cast on you and the deep respect you have acquired for this place...," you are so correct. Dukes is also on Kauai and it is a fun place to go to. You provide outstanding images which tie in so well to all that you say. I will definitely pass this along. My relatives understand the value of a Costco going up in their community--how it benefits economically. What I see is sad is when small local grocery stores that I used to walk into barefoot as a child are torn down. The house we lived in was torn down and turned into an office. But, overall, the islanders on Kauai are heartwarming and content people and I often wonder if it is I, who is spoiled, with what I am exposed to routinely and they are not, for they want for nothing more. I suppose if I lived in paradise also, I could adopt the same state of mind. Thumbs up, smiles up on this one. Thank you. Thanks Chance! Big props coming from you! Thanks StonePost! Glad you stopped by. Appreciate the feedback, cheers! Thank you for this wonderful hub! Love the pictures- voted up, useful and beautiful! @Ann, thank you! It was hard to leave, always is. Glad you liked it! 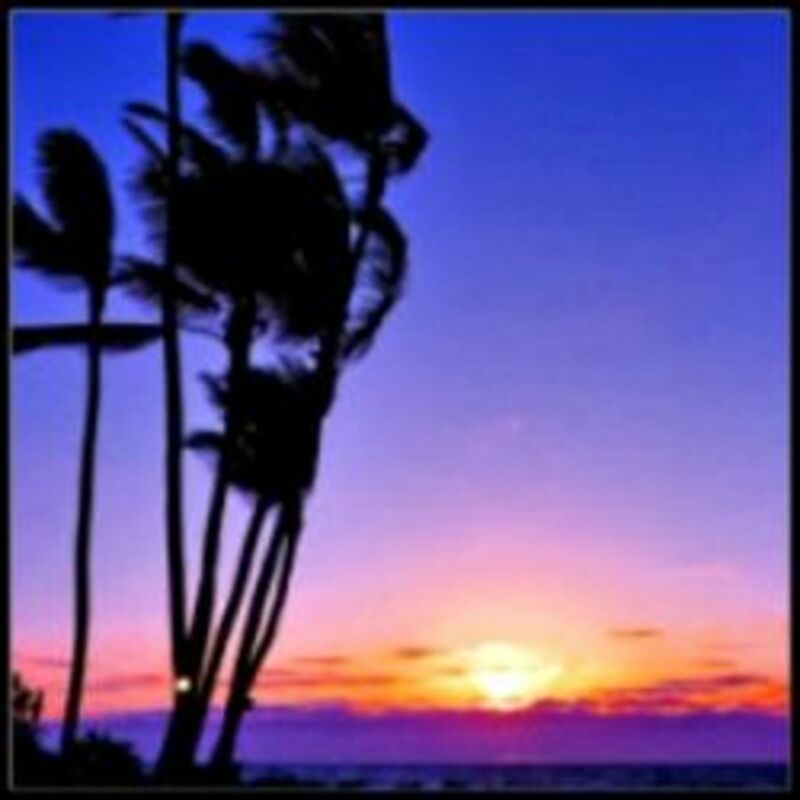 @Yogakat, good point-no obvious homeless in Kapolei.and let's hope it never gets that bad! Thanks for the poignant comments. Aloha. I have taught yoga at the 20 year old Ihilani Hotel in Kapolei, Oahu for 11 years. Disney's Aulani which opened 2011 and the Marriott KoOlina Beach Cub which opened around 2006 have turned a remote haven into a mini Waikiki - okay not as bad as that! You are right about the locals shrugging - that is their mentality. Also the newly created jobs have really helped the economy on Oahu's more needy Leeward side, but no homeless at the KoOlina Resort in Kapolei - the privately owned resort has an "Aloha Team" that looks after residents and guests with a sharp eye. This was an awesome article, very thorough and accurate and to me right on target in sentiment. Mos, I don't think I would ever leave that place. Photographs were phenominal! Voted beautiful, useful and up. Thanks mega1. Congratulations to your son! Yes, when you visit Kauai it IS hard to believe it is real. Thanks for commenting. Cheers! Really nice hub - my son got married on Kauai in September this year and now I am convinced I will be coming back to Hawaii to explore the other islands as well. I had to keep pinching myself, couldn't believe the awesome beauty there. Experiencing a city like Honolulu in the midst of the tropics will be something I don't want to miss. Thanks for sharing your knowledge of this wonderful place. 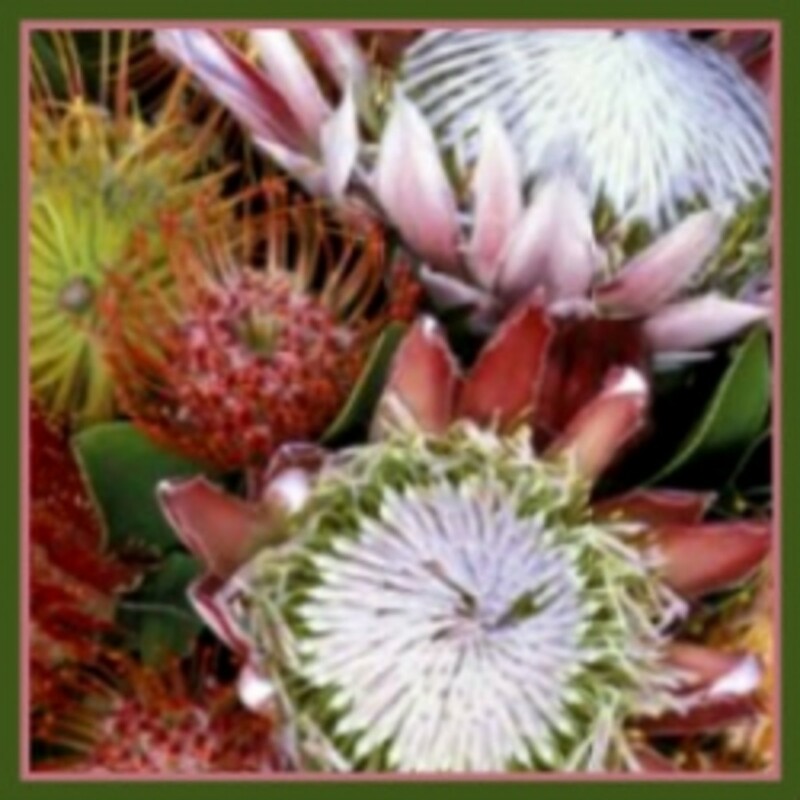 Thank you Rachel Richmond, R Pirate and instantlyfamily for commenting, it is much appreciated! Happyboomernurse, I feel like I got an early Christmas present, thanks! And do go, it's well worth the trip, and the money. What an awesome, thought-provoking hub. Not your usual travel tour info but rather a glimpse into a side of Hawaii that tourists rarely notice or see. I've never been to Hawaii and so only have the images of it that are seen on TV, in movies and in tourist booklets but this hub has shown me it is not so different from other tourist destinations - the resorts can look fabulous and yet poverty, pain and crime can be just around the corner. "You learn to be humbled by this place, to appreciate and respect it. If you can do this, it doesn't really matter where you stay or who you are; chances are good the island will welcome you. You can feel free to explore, or free to stay in one place and breathe in the intoxicating air." Thanks for sharing this information. Voted up, useful, awesome and interesting. I also enjoyed the stunning photos. Aloha! I enjoyed this hub. Thanks for sharing. Wow - I'd never heard about the homeless side of Hawaii, nor how the look of it has be allowed to be vastly changed. Thanks for the article.